With the return of Morocco decided on 30 January 2017, all African states are now members of the African Union. The 55 members are grouped into five geographic regions (North, South, West, East and Central). The diaspora was constituted as the sixth region in 2003 to encourage the participation of people of African origin living outside the continent. West Africa is, with its 15 members of the Economic Community of West African States (ECOWAS) the region with the largest number of countries. It is also the most populous region, with an estimated 350 million people in 2015. Nigeria counts for more than half of West Africa’s population. It is expected to become the world’s third most populous country by 2050, following China and India. 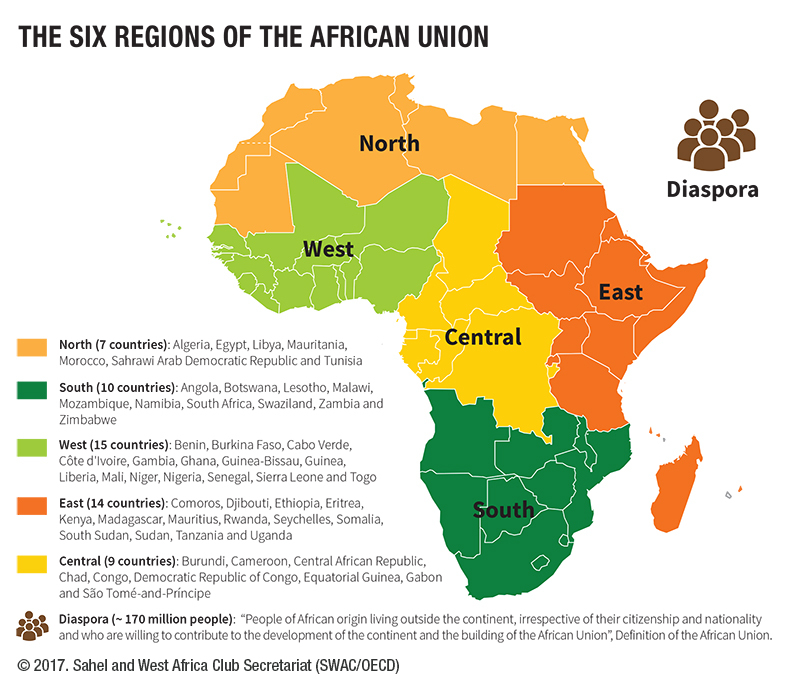 The African Union recognizes eight regional economic communities (UMA, COMESA, CEN-SAD, EAC, ECCAS, ECOWAS, IGAD and SADC). They are closely integrated with the African Union’s work and serve as its building blocks. Despite many challenges, ECOWAS is among the best-performing economic communities on the continent.